-- Select a Size -- Small - Out of Stock! Medium - Out of Stock! Large - Out of Stock! Now your cat won't have to be left behind with the Adventure Kitty Cat Harness with Leash by RC Pet in Black. For equipping an adventurous cat for the great outdoors. The Adventure Kitty Harness will keep your kitty safe and comfortable when walking or hiking. 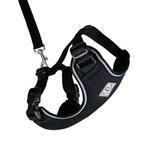 No more having to use a small dog harness on your cat. This harness was designed specifically for felines. Small: Chest: 11"-15", Neck: 8"-11"
Medium: Chest: 13"-18", Neck: 10"-15"
I love Baxterboo. It is the only place I shop for Amy's gear.